You don’t want a dirty carpet in your home. You especially don’t want a smelly carpet in your home. There is nothing more embarrassing than odors in your home and carpet odors are no different. Where do carpet odors come from? The most obvious source of carpet odors are stains on your carpet. If you spill something with a potent odor that odor will continue to emanate from the stain and from your carpet for as long as the stain remains in your carpet. This type of odor can be addressed quickly if you are able to blot out the stain with a wet cloth or paper towel immediately after the spill. It becomes trickier if you do not address the stain immediately and the liquid and odors permeate into the carpet fibers. Once liquid and odors are embedded in carpet, it requires professional Fort Wayne carpet cleaners to remove the deep stains from the pad and fibers. Pet urine stains on carpet emanate an odor you don’t want in your home. This carpet odor is even worse than a standard spill or stain in that the presence of the odor encourages future “accidents” from your dog or cat on that area of your carpet. In this case, the carpet odors from pet urine compound the problem. Another source of carpet odors is moisture and wet carpet. Your carpets are subjected to excessive amounts of water during water damage emergencies in your home as well as in damp and dark rooms and corners in your home. Hiring a Fort Wayne steam cleaner can also leave moisture behind in your carpet due to the gallons of water required for their carpet cleaning process. If there is moisture in your carpet it can lead to musty smells or carpet mold. The presence of carpet mold causes an odor that can lead to respiratory issues. 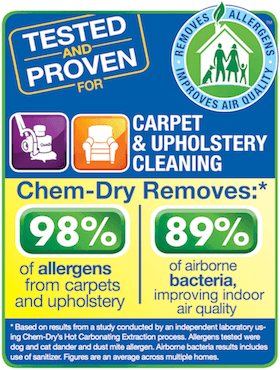 Chem-Dry of Fort Wayne carpet cleaning service uses 1/5th the water of steam cleaning. We remove soaked-in stains, surface-level dirt and liquids and extract all of the moisture we use in our process for superior results. We will eliminate the carpet odors in your home for a clean, fresh environment you, your family and your guests will feel comfortable in. Call (260) 409-1138 to schedule an appointment!